While seemingly every sell out in Hollywood is busy adapting some 70’s television show or 80’s Atari game for some hack film project, they’re missing a prime opportunity to tell a (possibly) riveting story: The invention of the chocolate chip cookie. The story is that one night, Ruth Wakefield, proprietor of the Toll House Inn, desired to make chocolate-butter drop cookies for her visiting guests. Upon finding that she was short of baker’s chocolate, Wakefield substituted fragments of semi-sweet chocolate, believing they would melt in the oven. They didn’t. What was should have been almost a dense chocolate shortbread was instead the rough draft of what would become the signature chocolate chip cookie recipe: The Toll House Chocolate Chip Cookie. Who else would be the leading provider of semi-sweet chocolate but Nestle, of course. After Wakefield’s accidental recipe caught on, the two entities, baker and chocolate entrepreneur, came to a bargain. Nestle would print the Toll House recipe on the back of every package of semi-sweet chocolate. In exchange, Mrs. Wakefield would receive free chocolate for the cookies made at the Inn. Thus, a cookie empire was born. 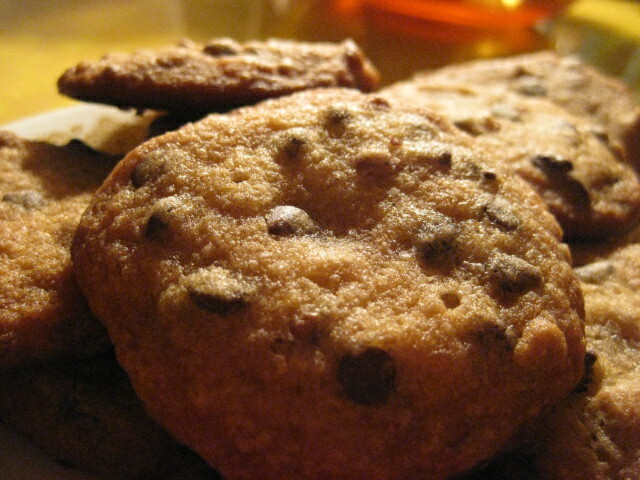 I try to do my part to contribute to the world popularity of the chocolate chip cookie. It’s not hard to understand why it’s so popular. It’s a malleable creation that can be manipulated in any number of ways. It can be flavored with extracts, made softer or crunchier or chewier, made giant-sized or bite-sized, super dense or wafer thin. It can be very sweet or a little salty or even a little spicy. It can be crumbly or melty. You can eat it with ice cream. You can eat it with peanut butter. 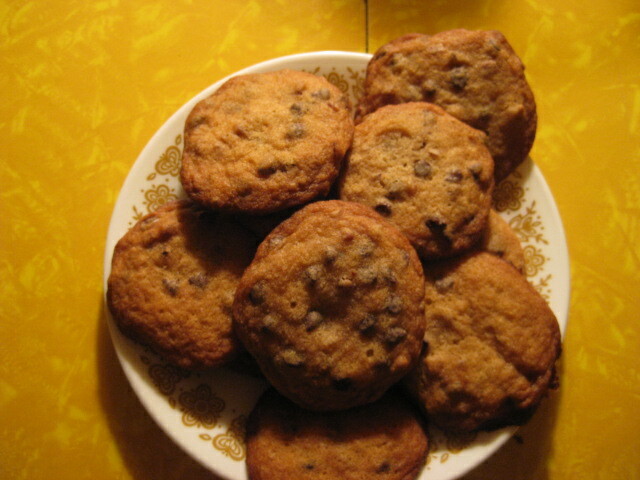 The variations are endless, and short of flat out improper baking, it’s hard to ruin a chocolate chip cookie. They’re also incredibly easy to veganize. Something that many people worry about when considering veganism is a loss of the familiar foods they’ve eaten all their lives. That’s why you see so many veggie burgers, so many different kinds of vegan macaroni and cheese, and why some of the best-selling vegan cookbook titles are focused on baked goods. People want to know that even if they make a choice to actively and avidly rid their diets of animal products, they will not have to go without their comfort foods. My favorite vegan chocolate chip cookie recipe to adapt is the one found in Colleen Patrick-Goudreau’s The Joy of Vegan Baking (which I’ve mentioned before, but is worth mentioning again, because it’s such a fantastic book). I like Colleen’s recipe for several reasons, but mostly because there’s very little fuss to it. Like many of her recipes, she doesn’t play around too much with various ingredients, throwing in random fanciness because she can. Her recipes are designed to produce the best-tasting traditional baked goods a vegan chef can hope for. – Preheat the oven to 350 degrees. Lightly grease a cookie sheet. – Cream together the margarine, sugars, vanilla. Add the applesauce and mix until thoroughly combined. 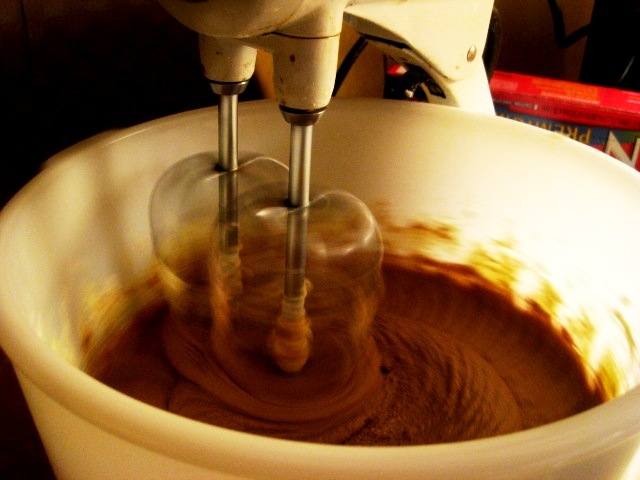 – Mix together the flour, baking soda, and salt, then gradually beat the dry mixture into the wet. When almost completely mixed, add chocolate chips and nuts. – Drop by tablespoon onto the sheet and bake for 8 to 10 minutes. Move to a cookie rack for cooling. I love Christmas, but I hate a lot of Christmas music. This happens to a lot of people. If you work in retail for long enough, you start to hate Christmas music, and long after you’ve moved on to new employment, the beginning strains of most holiday music makes you go numb with terror. At least that’s been my experience. Still, I’m not a total Scrooge, even where Christmas music is concerned. There are at least a dozen Christmas and holiday-related songs that I actively like. What’s more, this time of the year when I’ve set about doing my baking and entertaining and drinking, I like to have some seasonal tunes in the background, infusing the experience with holiday cheer and sentiment and all that softy goo. Recipe: A weirdly comforting, weirdly upbeat song about the routines of the annual holiday (“Long-distance relatives, haven’t seen’em in a long, long time/Yeah I kind of missed ’em, I just don’t wanna kiss ’em, no/It’s Christmas all over again”) deserves a traditional, but quality comfort offering. Gingerbread Cookies with Royal Icing from Conor & Bella’s on-going series using recipes from The Joy of Vegan Baking (a personal favorite) should do the trick. Just like the song, they’re a little gem in the dressing of something routine and expected. Recipe – My favorite Christmas songs are both celebratory on the season and a little sour or a little melancholy. For people who have never heard this song, I describe it as thus, “It’s about being hopeful and hopeless and drunk and in love during Christmastime.” Get drunk and hurl insults at your beloved by visiting Delicious Noise for Monica’s seasonal offering, the Godfather cocktail. Recipe – I don’t want to take the holidays too seriously, and this song really helps. Many people don’t realize that they know this song until they hear it. And because it gets a shout out early on in the song (“It’s Christmastime in Hollis, Queens/Mom’s cookin’ chicken and collard greens“), why don’t you try out Food’n’More‘s recipe for Collard Greens Southern Style? Recipe – I know that plenty of people have peaceful, joyful Christmastimes, but holiday gatherings with my extended family often meant fighting. Play this song to honor the spirit of both fighting and trying not to fight during Christmas, then throw back some holiday brews (cause beer encourages peaceful behavior, right?). Need some suggestions? Check out Mike’s on-going “12 Beers of Christmas” over at Burghertime. – Epicurious is having full-on holiday fever. If you’re stuck for ideas, their 25 Days of Christmas Cookies is definitely a good starting place. Sparkly lemon sandwich cookies, florentines, shortbread, gingerbread, every variety of cookie for the holiday season. And if anyone tries the brownie thins recipe, let me know how it works out. – Need more peppermint? 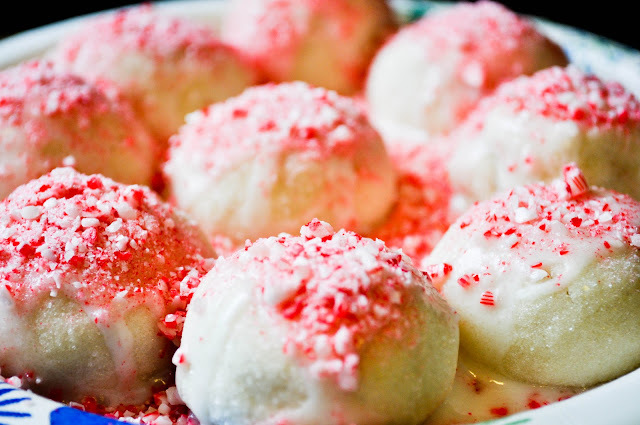 Mamma Town has you covered with a recipe for Peppermint Snowball Cookies. These cookies look like little sacks of peppermint chunks bursting open. (Seems like all I’m doing these days is crushing peppermint candy. I’m gonna need to get a grinder just to have on hand for candy fragments.) Because this recipe offers easy options for vegan substitutes, it’s definitely on my “Nice” list. – If you crave the cookie, but not the crazy sweetness, check out Les Saveurs for their Spicy Gingerbread Cookies. With their dark, rich color starkly contrasting with the little dots of white icing, these classy cookies are perfect for a seasonal gathering of unspecified nature, a very modern way to celebrate the holidays. Or if you want to sit around your house in flannel pajamas eating cookies. I suggest combining the two and having a holiday pajamas and cookies party. – Peppernuts, Pfeffernusse, Pepernoten – by any name, these cookies are still crunchy, tasty, and utterly unique to a holiday cookie spread. 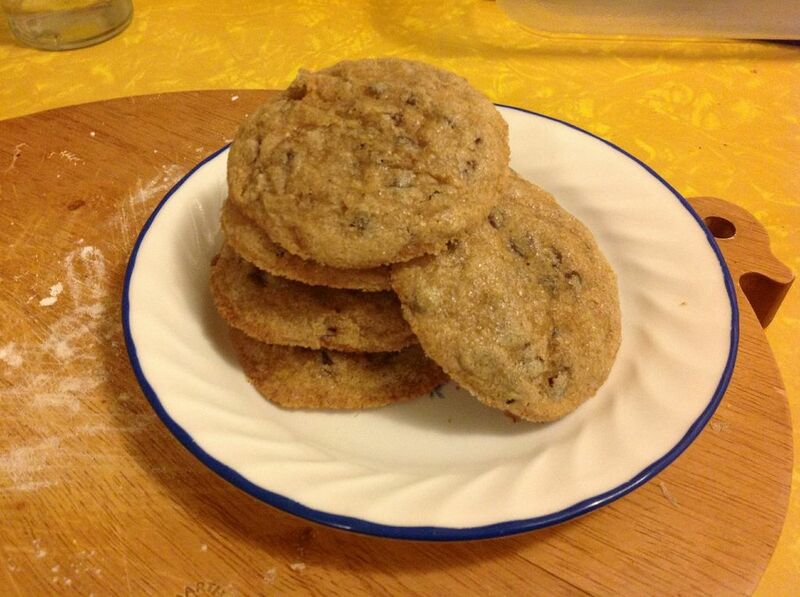 Sarah gives us a neat and tidy little recipe for the traditional cookie (a favorite of the Pennsylvania Dutch). Remember, kids, if it’s not chock full of black pepper, it’s not proper pfeffernusse! 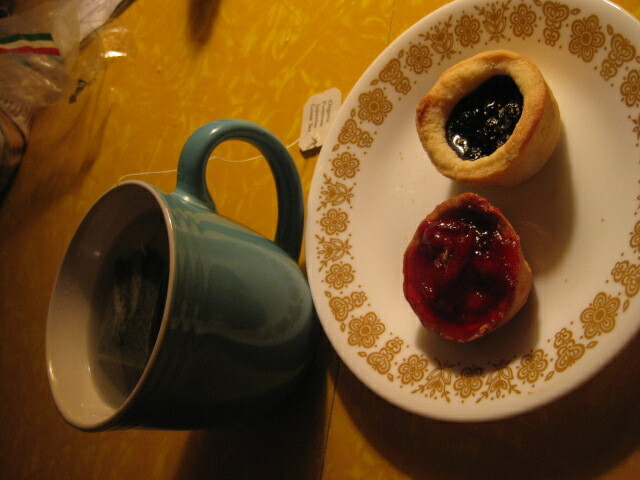 In which a genuine attempt is made to invoke the holiday spirit via baked goods. I have made my particular opinion on holiday-themed treats known, but I will reiterate: In general, with a few exceptions, I am not a fan of holiday baked goods, my reasons having been best laid out here. Too much fuss, too much gunk, not enough good, simple flavor to make all the effort seem worth it. But I’m no Scrooge. I am susceptible to Christmas cheer as much as the next hot-blooded American consumer. And on Monday morning, I was struck with the urge to make merry, watch sappy Christmas movies, share some wine with friends, and bake bake bake holiday treats. Epicurious has a nice collection of holiday cookie recipes, many of which aren’t super ornate. 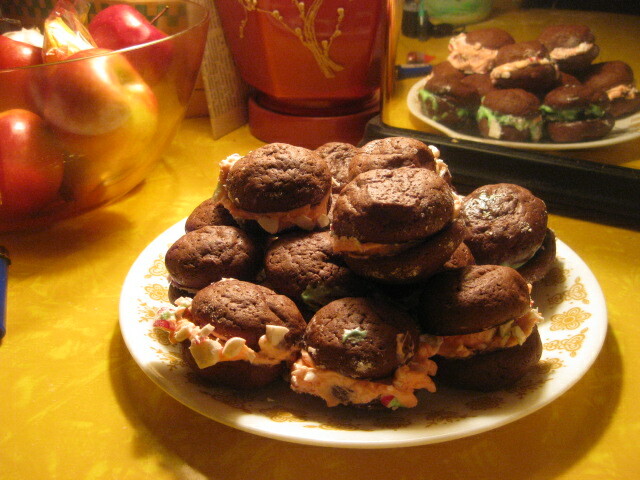 I had one of the visiting friends pick a recipe from their selections, and she chose the Chocolate Candy Cane Cookies. Now these are more elaborate than I tend to make, as I’m not a huge fan of icing sandwich cookies (it has to be just right in flavor, texture, and ratio of icing to cookie), but they looked fun, Christmas-y, and a once over of the recipe proved that they could easily be veganized. So-ho-ho why not? 1/2 cup crushed red-and-white peppermint striped candies. 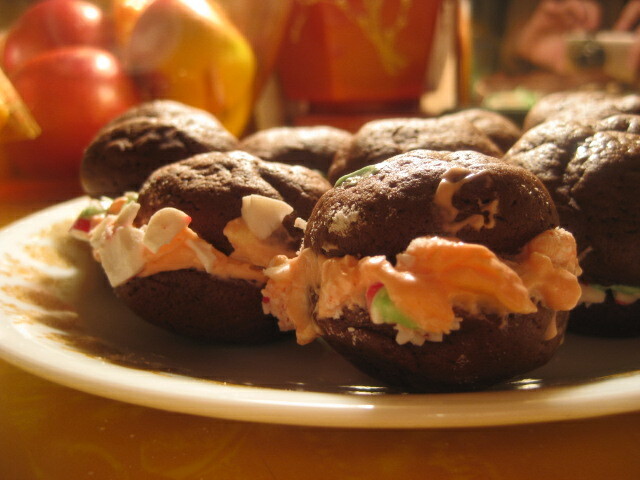 – Mix flour, cocoa, and salt in bowl. Cream together sugar and margarine in mixer, then beat in tofu. 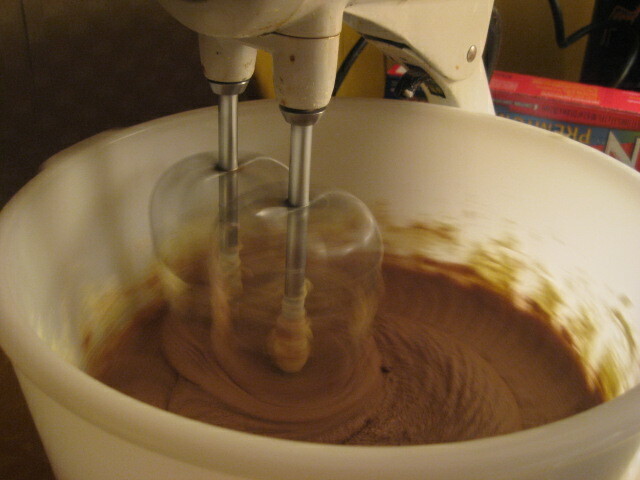 Add dry ingredients, beating until blended. Store the dough in the fridge for at least an hour. – Pre-heat oven to 350 degrees. Lightly grease cookie sheets. Once the dough is hardened, scoop out with a tablespoon and roll into little balls, placing them about 2 inches a part on the sheet. This is where I flubbed a bit, leaving the balls to bake as is, instead of following the directions and flattening them. Whether or not you do that, the cookies will bake properly. It’s all about how you like your cookie sandwich. 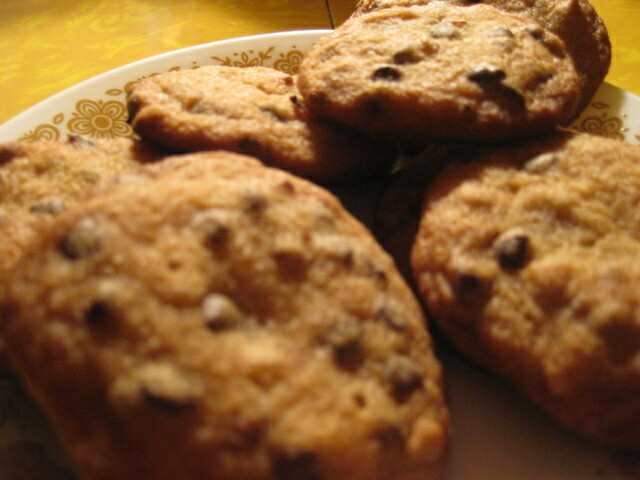 – Bake cookies for about 11 minutes, until a fingertip pressed on the top leaves an indentation. Remove and let cool on cookie rack. – For filling: Beat sugar and margarine together. Add peppermint extract. As for food coloring, if you just want one color, add a few drops to the main bowl. Otherwise, portion some into another bowl and add the red to one, green to the other. – Peppermint candies – We put the candies in a bag and hammered them. Lay a dish towel down, put the candies in a large Ziploc bag, then using a mallet or hammer, gently shatter and crush the candies until they are reduced to merry little peppermint shrapnel. – Assembling the cookie sandwich – Match cookies to like sizes. Add a teaspoon of filling to the flat side of one cookie. Place second cookie on top, squeezing together so the filling just peeks out from the sides. Then take the cookie and roll the edges in the peppermint candy pieces. If this process proves to be ineffective, add the peppermint candy pieces to the filling on the cookie before sandwiching. Overall, the recipe was good, but not great. The cookie sandwiches weren’t quite sweet enough (the cookie or the filling), and the filling reminded me too much of less than substantial cupcake topping. They were definitely pretty to look at, but their method of adding the peppermint candy to the sides was better in theory than in practice.